Revolutions are rarely undone from the outside. Mostly they come apart from the inside as the forty thieves descend into petty squabbling over the loot. The loot comes in different forms, but at its core it is always power. It may be the power to kill or to steal. It may be the power to claim a nice piece of real estate or to send a million people off to their deaths. The scale of it will occupy historians and shock the people of the future who leaf through the history books and walk through the silent museums, but it is all of one piece. The purpose of power, as a fellow in a little book by George Orwell once said, is power. The quarrel between Obama and the Media is largely a lovers’ quarrel, but the love is only there on one side. The media made Obama what he is. But what he is, among many other things, is a control freak spawned by a political ideology that distrusts everyone and consolidates power at all cost. The media loved Obama, but it discovered early on that he did not love it back. Instead of basking in the adoration of the Candy Crowleys and the Anderson Coopers and the massive corporate machines behind them, the love child of every liberal fantasy shut them out, rigidly controlled their access, and ruthlessly punished unauthorized conversations with the press. The media had made Obama into a tin god, but were constantly suspected of heresy. Instead of being rewarded for their loyalty, they were kept at arm’s length. Obama Inc. knew that their biggest asset was the narrative. A close study of Obama’s qualifications or accomplishments would have given no conceivable reason for voting for him. The only thing he brought to the table was race, and even in this he was less qualified than most of the black men who had run for president. The narrative was the dearest treasure of Obama Inc. It was the one thing that its cronies protected. The economy could tank, wars could be lost, and an asteroid could smack into the Pacific Ocean, and none of it mattered nearly as much as the golden narrative. They didn’t trust anyone with it including the media. The media these days doesn’t have much. Its numbers are bad in every medium from the tube to the inky pages of newsprint to the crackling AM radio waves. It isn’t very profitable. Often it’s a dead weight. But it wields a great deal of institutional power. The New York Times and CNN may both be dogs when it comes to the balance sheets, but owning either one gives you an impressive amount of heft in the national dialogue; though not as much as working for one of them does. Power is all that the media has. Its power is projected in a fairly narrow circle. Fewer people are reading, watching and listening to it, so its circle becomes more incestuous. Everyone has learned to act like a member of the D.C. press corps, interpreting events through the lens of old West Wing episodes. The resulting noise reaches fewer people, but helps form the shaky consensus on which the institutional power of the media stands. In its dying hour, the media used that power to ensure the double coronation of a corrupt Chicago politician with a facility for mimicking speech patterns. And that politician rewarded it by trying to bypass it and set up his own media. Obama’s vision of the proper place of the media isn’t just at his feet, but under his control. Instead of dealing with the media, he has tried to cut it out of the loop by putting a larger emphasis on social media and developing narratives through think-tanks and media-influencing groups. It was a power struggle that the media was initially baffled by. It had held out an ice cream cone to the little boy, only to have the little boy kick it in the shin, grab the ice cream cone, and run away. For years the media had groused about a lack of transparency, the unprecedented prosecution of whistleblowers and the hostile relationship between Obama Inc’s minions and many reporters. The grousing was usually understated. It could be mentioned offhand, but not too loudly. When Bob Woodward made the mistake of speaking his mind, he was swiftly punished for it by the avatars of the post-media media, while the old media sat silently and watched the show. But then Obama pushed its limits by invading the sanctum of the Associated Press. It was one thing when the administration was targeting whistleblowers, but quite another when the media’s power became part of the collateral damage. The week of scandals was the media reminding Obama that his smooth ride had been provided by them and that the ride could get very bumpy if his media ponies decide to take the back road to Benghazigate or drop by the IRS headquarters. It’s a bluff, of course. The day may come when the media takes Obama out back and disposes of him so that the new messiah, perhaps in a pantsuit, can ascend the old Camelot throne, but that day isn’t here yet. Scandal week was a game of chicken between Obama and the media to see who would blink first. Would Obama decide to respect the institutional power of the media or would be consider pushing forward until the media blinked. A brief history of Obama Inc. suggests that he will keep pushing on. Obama backs down from Muslim terrorists and Russian government thugs, but not from Americans. Like most cowards, Obama only attacks those he knows won’t fight back. And the only people who won’t fight back are either helpless or bound by their politics not to resist the liberal messiah. Obama knows that the media does not dare harm a hair on the head of the liberal agenda. And he made certain to appoint a Vice President whom no one in their right mind would want to see take over. Until 2016, it’s Hussein or the highway. The media has shown that it can hamstring him even when the coverage is only mild. It is quite capable of turning up the temperature to boiling, though not without a civil war with Media Matters, Think Progress, and a chunk of the liberal new media. The media is a prisoner of its own ideology. It can’t hit Obama too hard… yet. Not until they’re making the case that Hillary will do a better job of governing than this inexperienced tyro did. Having abandoned any professional integrity years ago, it would be too late for most of the media to reclaim it now. Even in the name of its own institutional power. This is the process by which leftists have collaborated in their own purges. It is why wealthy leftists financed revolutions that would rob them. The media’s wealth is in its institutional power and it is being forced to accede to the redistribution of that influence. Obama is not interested in an independent media, even if it is biased his own way. Leftists are great centralizers. They seize power by consolidating it under their control. The Democratic Party is struggling as Obama’s OFA Super PAC loots their fundraising operations. Why does Obama need a Super PAC? Because it gives him another source of personal power while diminishing the power of established institutions. And the news media is just one more established institution for the children of the counterculture to beat to death with its own microphones. The media is trying to make a statement about boundaries, but it lacks commitment. Even as it halfheartedly, though for the first time, covers actual misconduct by Obama Inc. with that smidgen of outrage which usually only creeps into its own when reporting on the dreaded (R’s), it undermines its own show of force by discussing how quickly Obama will be able to get over the hump and back to his agenda. The media’s blackmail of the man listening to its phone calls and scanning through its emails lacks conviction. Obama needs the media, but the media needs him more. It doesn’t need him for practical reasons, but for emotional reasons. It needs to believe that its corrupt institutional power has been put at the service of a higher purpose and a higher calling. It needs to believe this all the more as the ratings drop, the papers go unsold, and the radio stations fill up with the voices of conservative talk show hosts. That emotional need makes the media the prisoner of this administration. 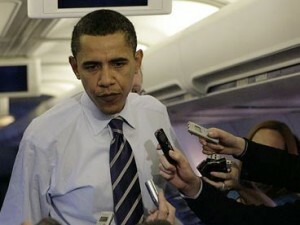 On his end, Obama has a practical need for the media, but no emotional need. Interviews, even of the softball media kind, challenge his control. They question him, and Obama does not like being questioned. While media figures see themselves as serving a meaningful liberalizing institution, he sees them as carriers of a narrative. A narrative that can just as easily be carried anywhere else. When Obama looks at the media, he doesn’t see Walter Cronkite, he sees a bunch of radios, televisions, and newspapers; which these days are little more than footnotes for the internet. There is nothing special about that to him or his cronies. Just mediums that distort his message because he doesn’t control them. And so Obama chooses to control every medium he uses. The Obama media war is good clean fun, but it’s also a brief skirmish. Neither side can afford to extend the battle for very long. For the media, the scandals will vanish as soon as they hear magic words like “Gun Control” or “Illegal Alien Amnesty”. And for Obama, the war will end when one side or the other blinks. Such a good article and so right on the mark. Where does that leave the average American who can see that this skinny-a… Kenyan tyrant is abusing power and engaging in criminal behavior. His propaganda machine, the media is allowing it to go on, they are promoting it. Stale Candy Crowley is just another White House mouthpiece. but we’re impotent to do anything about it. Not at all, not… at all! secret killings of those who do not pay tax. I hear 25% of US citizens think this “Kenyan tyrant “ is really the anti-Christ. Where do you stand? I read here he really is engaging in criminal activity. Does this refer to the war on terror? I thought that Obama was elected by the free citizens of the US. The ordinary people defeated the multimillionaires and the billionaires. The Australian Murdoch did not buy the presidency for his rich pals. Sheldon Adelson did not buy the presidency for Israel, even though Romney went to Israel and did what he was told to do by Adelson. The ordinary people won. Good news in the US is bad news for those who detest Obama. Hence the US is doing badly, because with Obama it is doing well. Here in CL good news is not wanted. But consider that house starts are increasing, stock markets are doing well, consumer confidence is increasing, the rates of decline in company earnings, employment and incomes are decreasing. But with America doing well it is bad for those who hate Obama. PS: I read here “Instead of dealing with the media, he has tried to cut it”. Tut-tut, the word “media” is plural.